Despite efficacy of anti-tumor necrosis factors (anti-TNFs) in treating chronic immune conditions, some patients (pts) report serious adverse events (SAEs) highlighting a need to identify at risk pts before starting treatment.1,2 We examine safety data for rheumatoid arthritis (RA) pts treated with the anti-TNF, certolizumab pegol (CZP), in the RAPID1 and RAPID2 randomized clinical trials (RCTs; NCT00152386/NCT00160602) and their open-label extensions (OLEs) to identify baseline (BL) risk factors for specific SAEs, with the goal of risk stratifying pts for adverse outcomes to provide more personalized estimates of expected risks and benefits of therapy. Post-hoc analysis was performed on CZP safety data pooled across RCTs (RCT CZP data) and RCT+OLE periods (All CZP data). Pts with prior anti-TNF/biologicals use (4.1%) were excluded from analyses due to limited pt numbers in this group. 3 non-sequential stepwise multivariate Cox proportional hazards models were used to estimate relative risk (Hazard Ratio [HR]; entry p≤0.2, stay p≤0.25) of BL covariates to the first serious infectious event (SIE), major cardiovascular event (MACE), or all-cause death. Any event between first CZP dose and 84 days after the last study dose or pt withdrawal was included. BL covariates included age (< or ≥65 years), presence of comorbidity (any treated cardiac disorder, diabetes or COPD), systemic steroid use (0, >0-5, >5 mg/day), methotrexate dose (≤ or >15 mg/week), RA disease duration (< or ≥2 years), and a range of BL disease activity measures. A total of 311 placebo (PBO) pts (130.5 pt-years [PY]) and 1224 CZP pts (798.5 PY) were included in the RCT analyses, with 3 and 50 pts, respectively, reporting ≥1 SAE of interest. 1 and 2 PBO pts experienced ≥1 SIE or MACE, respectively, and 1 died while 40 and 8 CZP pts experienced ≥1 SIE or MACE, respectively, and 7 died. BL predictors of SIEs for the RCT data were treated comorbidities and systemic steroid use (Figure A). For All CZP data, 246/1506 RA pts (5778.6 PY) reported SIE/MACE/death: 201 and 32 pts reported ≥1 SIE or MACE, respectively, with 38 deaths. Time to first SIE was associated with several covariates screened as potential risk factors. BL treated comorbidity had marked associations with time to first SIE (Figure B). No other covariates examined were considered relevant to the outcome. Age was a predictor of MACE and death but the low number of events limits interpretation of this finding. 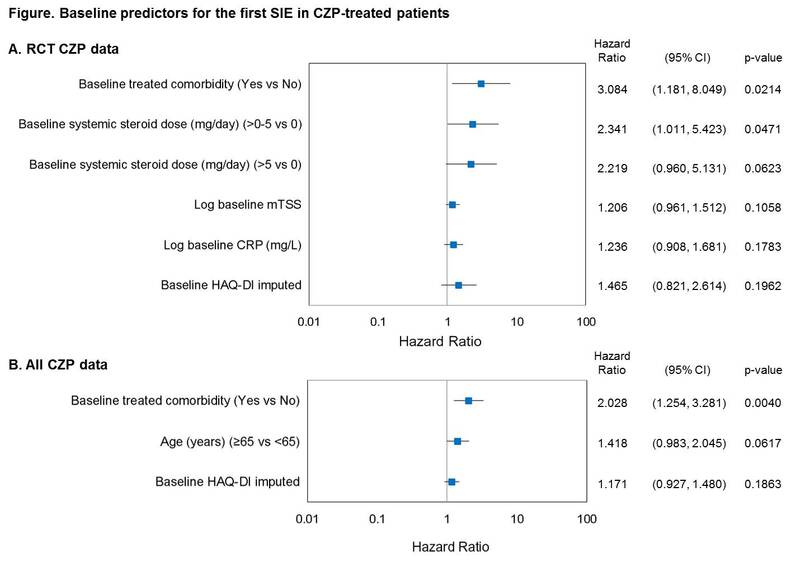 CZP-treated pts with certain comorbidities were twice as likely to experience SIEs and the risk remained elevated when data were pooled across RCT +OLEs. Knowledge of BL characteristics related to an increased risk of SAE of interest should help clinicians to better identify those pts and help manage some of the risks related to anti-TNFs.